Recently, I received the following query from one of our blog followers. This is a great question. Let’s look at autosomal DNA and how DNA works, and we’ll soon see why genealogical and anthropological (ethnic admixture) DNA overlap. And by the way, kudos for reading the FAQ! In each generation, the child receives half of their DNA from Mom and half from Dad. As you look back in time, you can see the inheritance percentages, approximately, in the table below. Why do I say approximate? Because when the DNA of Grandma and Grandpa that Mom (or Dad) carries is being selected to be passed on to the child, there may be a little more or less of Grandma or Grandpa’s so while the child does receive exactly 50% from Mom and Dad, they don’t receive exactly 25% from each grandparent. It could be 60-40 or even just 49-51. It’s here that things begin to get complicated. You can see that in just 7 generations, we are below the threshold of 1%. This is why Family Tree DNA says that their ethnicity prediction is reliable through about the 5th or 6th generation. Beyond that, you’re at less than 1% of any one GGGG-grandparent. Over time, the DNA from any specific ancestor, especially one from 20 generations ago is likely to “wash out”, meaning that in the next generation, the child is less and less likely to receive anything from that ancestor, and what they do receive would be in increasingly small pieces. However, that’s not always true, because we clearly do inherit our DNA from someone. So let’s look at an example using the Family Finder Chromosome Browser from Family Tree DNA which allows you to compare the inherited pieces of DNA of multiple people. The graphic above shows the comparison of my mother to me, shown in orange, and then to a Miller cousin, shown in blue. My mother and I share half of all of our DNA, so my orange matches her on every chromosome. My mother and the Miller cousin, shown in blue, share a great grandparent, John David Miller. So both the Miller cousin and my mother could expect to inherit approximately 12.5% of their DNA from that Miller great-grandparent. While they wouldn’t inherit exactly the same DNA from that Miller grandparent, they would very likely inherit some of the same DNA from John David Miller. In fact, they could expect to inherit approximately 3.12% of the same DNA from him. 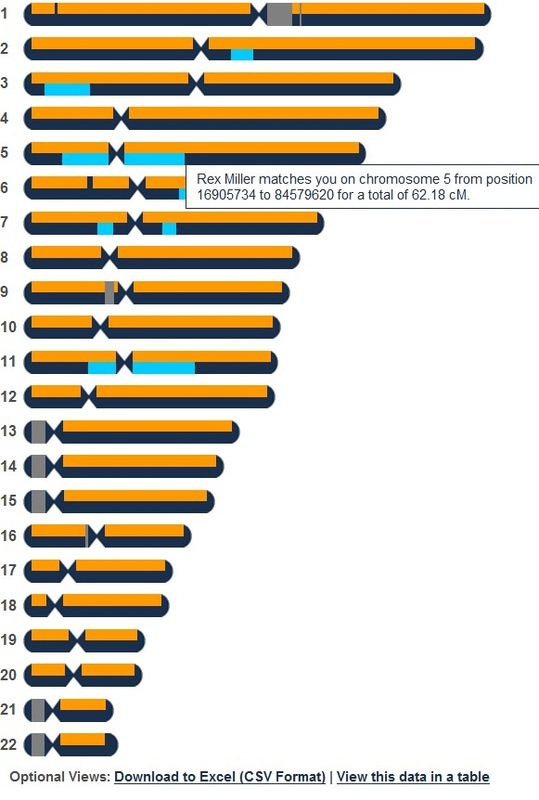 Looking at chromosome 5, for example, you can see that Mom and her Miller cousin share a total length of 62.18 cM (centimorgans, a unit for measuring genetic linkage, the distance between chromosome positions). 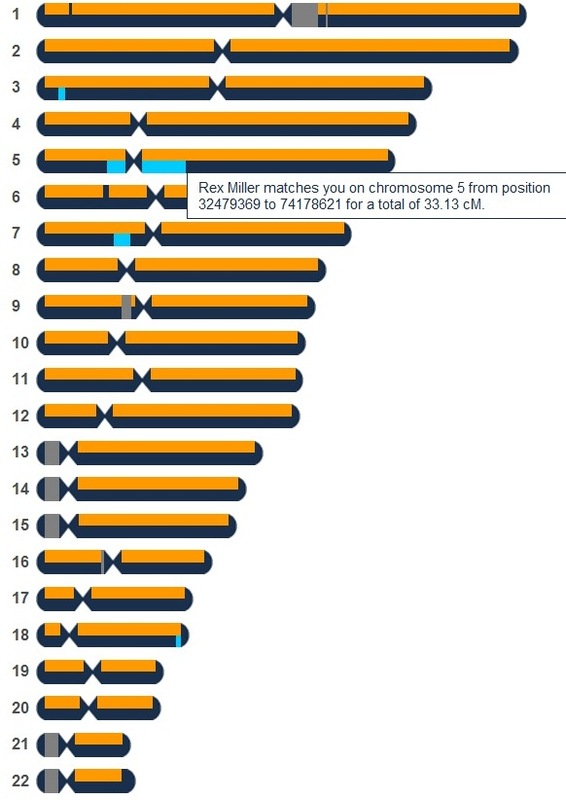 If you look at my comparison, below, with Mom and the Miller cousin, again, shown in blue, you can see that I inherited 33.13 cM of the same DNA, slightly more than half (53%) of the Miller DNA that Mom shares with her cousin. You can also choose to view this data in a table. Mom’s table, above, shows that the length of 62.18 cM is comprised of 14,024 individuals SNPs. For me, the same table, below, shows that my inheritance on chromosome 5 is really in 2 separate segments. The 33.13 segment contains 8100 SNPs, so more than half of the number (57%) my Mom’s carries. A second segment of 2.14 cM carries 500 SNPs for total Miller inheritage on chromosome 5 of 8600 SNPs (61%) . Why didn’t the second segment show up on the Chromosome Browser? Because I have the threshold set at 5cM, the default. In the card shuffle between Mom and Dad that decided which SNPs I received, a little segment of Mom’s other parent’s DNA got inserted in the Miller segment, so the Miller segment was no longer intact, but pieces of it are still there and one piece is large. You can change the cM threshold, but for people who are not known to be family, 5cM is a reasonable threshold to differentiate between identical by state, IBS which means happenstance or a common root population, and identical by descent, IBD, because you share a common ancestor in a genealogical timeframe. This Miller comparison is a good example of how SNPs are inherited and shows that while approximately 50% of the DNA from each of your ancestors gets inherited in every generation, it’s never really exactly 50%, either in length or in the number of SNPs inherited. It also shows how larger blocks of DNA are broken into smaller segments in each generation and how chunks move from being IBD to IBS over time and mutiple inheritances. SNPs, or single nucleotide polymorphisms, are the basic unit of inheritance. We look at 4 nucleotides to determine the condition, or state of that SNP. Sometimes SNPs repeat, are in essence strung together, and these are the STRs, short tandem repeats, we are so familiar with in the Y chromosome in genetic genealogy. These are our markers and the marker values are the number of repeats at marker location 390, for example. Most of the time, we’re just looking at one SNP location and the nucleotide held at that location. The magic of course, is when there are many of these nucleotides that are found in common as a group. A large grouping indicates a common ancestor, like we’ve seen above. However, for population genetics, the individual nucleotides and groupings of smaller segments are very important, because just like large blocks indicate families and common genealogical ancestry, smaller blocks indicate common populations. This is how population geneticists identify populations, and how tools like Population Finder identify specific populations from which we descend. Populations, however, blend, so this is rarely cut and dried, but occasionally, it is. The Duffy-Null allele is a great example. The Duffy Null allele is found only in African populations, and is therefore an important informative marker to determine African heritage. Currently this marker is found in about 68% of American blacks and in 88-100% of African blacks. If you have the Duffy Null allele, you have African heritage. Of course, you don’t know which line or which ancestor it came from, but it assures you that you do in fact have African Heritage This is one of the factors considered when determining percentage of ethnicity. The relevance of the Duffy Null allele is determined by the number of other “African” markers that appear in high quantity. If there are few other African markers, then African ancestry was likely further back in time. If there are many, then African ancestry was likely more recent. These statistical calculations are how the importance of autosomal markers is determined and how percentages or estimates of ethnicity are calculated. Most of the time, SNPs and clusters of SNPs aren’t this specific and are found in many populations in varying frequencies. It’s learning how to put this puzzle together, or rather, tease it apart, that keeps population geneticists busy. What all of this really means is that genealogical relatedness and population relatedness aren’t really two different things, but two different ends of a continuum where genealogical relatedness is evident by a high number of cMs and contiguous SNPs that match. We saw that in the Miller example. We know that if two people only show matches if you adjust the threshold to 1cM, for example, they are likely IBS, or only related via a population or region of the world. However, it’s the grey area inbetween that becomes confusing. For example, trying to determine whether someone who might be a cousin really is, or not, based on very small matching DNA segments. For situations such as these, the best answer is to test more cousins to see if they may have inherited differently. I guess that’s both the bad news and the good news in autosomal genetic genealogy, there’s always hope (and clarity) if you just test more people!!! This entry was posted in Admixture, African, Anthropology, Autosomal and tagged Introductory DNA by Roberta Estes. Bookmark the permalink. Is it really accurate to say “Sometimes SNPs repeat, are in essence strung together, and these are the STRs, short tandem repeats, we are so familiar with in the Y chromosome in genetic genealogy?” Microsatellites or STRs are not really “single” nucleotide polymorphisms are they? Rather, as you say, STRs are a repeat pattern of nucleotides of different length in different people. Both are examples of genetic variation, but they arise from different mechanisms and they have vastly different change rates, with STRs being hundreds of thousands of time more mutable than SNPs. complement before I hit the post button. Good article. I want to follow this thread. Clearly written. My understanding is that the Duffy null marker is historical in that it is found only in a population which has been subject to falciparum malaria. People in West Africa in particular have lost their Duffy antigen because it left them susceptible to malaria. Since fewer and fewer West Africans with the Duffy antigen lived to reproductive age, the absence of that antigen became a marker for West Africans. If you tested West Africans from 8000 years ago when Africans domesticated grain crops and anopheles mosquitoes began transmitting falciparum malaria to humans, you would find relatively few Duffy null people in the population. Great article, Roberta, on a subject that is confusing to many. I will refer people to this! Thank you!! Great article. I wonder if you could give some insight into my father’s results? He has no known Scandinavian (though FTDNA puts him at 23%), but he has about nine or ten matches (5th to remote cousins) from Finland and Sweden. Several of them match one another. They show up strongly on chromosome 9 at about 8cm. Could this prove Scandinavian ancestry or is it a fluke and merely IBS with no real relation? Any information is MUCH appreciated. Love what you are doing here. Very helpful and informative. It’s very difficult to tell. He’s had to match them on the same segments to really tell if it’s even promising. I don’t know what to make of it. As I said, the majority match strongly on chromosome 9 at about 8cm, but if they are real matches, they are too far back to trace. I just wonder why there are so many of these matches from Sweden/Finland. I suppose it’s a mystery that may not be solvable. Thank you for the reply.